The priorities that the government sets and the investments the government makes today are laying the groundwork for an Ontario of tomorrow that will feature a modern, clean and globally competitive economy; healthy, vibrant and livable communities; and an exceptional quality of life for all Ontarians. The government has a responsibility to ensure a clean, modern and reliable system for the health and well-being of Ontario families and businesses. The burning of fossil fuels such as coal, oil and natural gas has increased the concentration of carbon dioxide, methane, metals and other gases in the atmosphere. Scientists in the field unanimously agree that this will lead to a general warming of the world’s climate, a phenomenon known as the enhanced greenhouse effect or, more simply, the greenhouse effect. Biomass is typically considered to be greenhouse-neutral, which means it neither adds to nor reduces greenhouse gases. This is because, theoretically at least, all the carbon dioxide that was removed from the atmosphere by the growing plants is later released when biomass fuel is burnt. First, by substituting a renewable resource for fossil fuels – for example, using wood biomass, instead of petroleum – we could achieve a net reduction in greenhouse gas emissions. Second, if wood biomass is left to rot – as in a landfill site – it produces methane gas. The volume of this gas is approximately 24 times larger than the greenhouse gas emission of a combustion process. Burning of biomass does not emit sulfur which is the primary cause of acid rain. 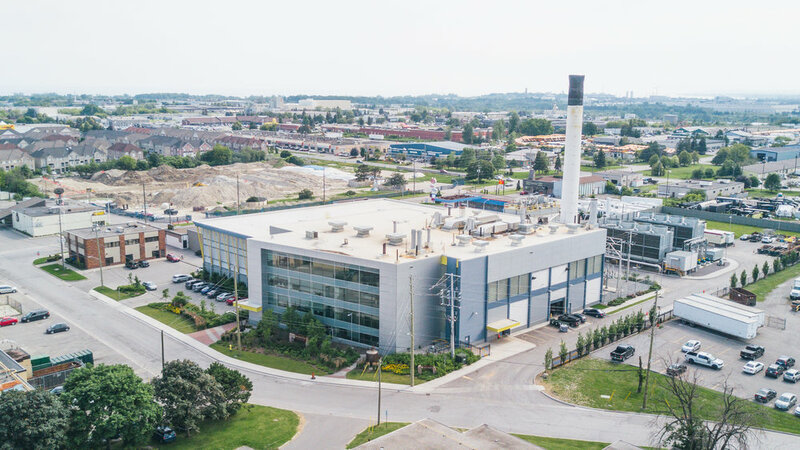 To provide competitively priced steam to the present institutional, commercial and industrial base in Ajax. To provide electricity to the electricity grid, as Index Energy is honoured with a 20 year contract through the FIT-program. To expand the present steam distribution system to provide heating for residential purposes. The steam is an excellent alternative resource for residential heating, heating domestic water and on-site electricity generation. To relocate Industry to Ajax in order to exploit the increased low pressure steam load due to electrical generation. Index Energy is proud to partner with Great Canadian Recycling (GCR) as a source of fuel to power the plant. GCR is a locally owned and operated business with over 25 years experience in waste management. GCR is affiliated with Simtor Environmental Ltd. which operates a waste transfer & recycling facility in Whitby. This operation processes incoming mixed waste streams for landfill disposal and separates recyclable materials for alternate end-users. The combination of our experience and the strategic alliance of GCR & Simtor Environmental creates a network of contacts & multiple sources of fuel for the plant so as to ensure we keep running 24/7, 365 days a year to keep thousands of homes warm and lit, even in the harshest of Canadian winters. Ajax co-generation facility uses renewable biomass as the fuel for our furnaces. An advanced system of ash filtration traps any harmful pollutants. This is then sold for use as fertilizer in growing new biomass fuels. Our Furnaces then heat water to create a high pressure steam environment. This trapped steam is then directed through two highly efficient turbines. The steam is then re-condensed into super-heated water which is sold to industry in the surrounding area. The final output of our steam turbines is in the form of electricity. 18 MW of power is ditrubuted to the surrounding city of Ajax. Ajax Steam Plant was built in 1941 to provide the steam heat vital to the production lines of the Defence Industries Limited (DIL) shell filling plant. As late as the mid 1950s, the plant was still supplying steam to much of the community. These lines can be seen in most of the early pictures of the DIL days as they all ran suspended above ground. Starting in the 1950s, whenever a major road was being constructed, the steam lines were moved underground. The main goal of the plant was to generate steam for industrial purposes of companies located in the vicinity of the plant. The future facility will still generate steam for industrial clients. In addition, the main focus will be on the generation of electricity that will be delivered to the grid. The capacity of the new plant is sufficient to serve existing customers, and attract new clients for the delivery of steam.